Survey Results: Are the Viz-Pundits Really Helping? A few weeks ago Juice asked our readers to give us a few insights into whether or not we and other info-viz sites are actually helping them and their organizations be more effective at communicating information. Well, the time has come to take a look at the results (oooh - pins and needles). 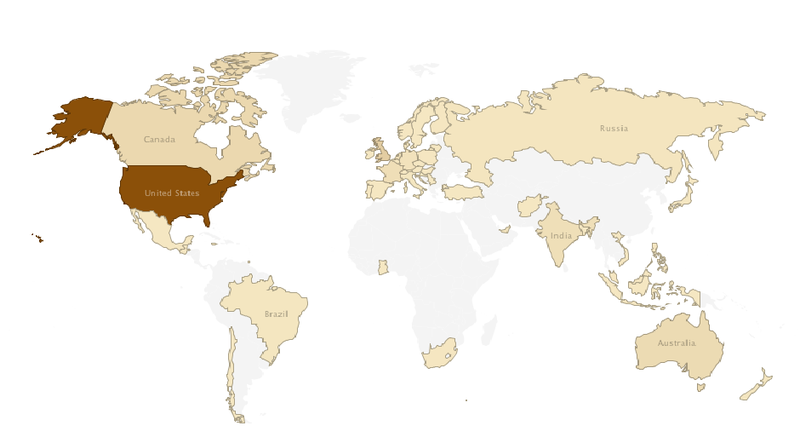 The survey was way more popular than we expected, receiving well over 500 responses. We had a few questions that were of the form "select the answer that best describes you" but, for the most part, we focussed on text based answers so that we could try to avoid directing the answers and could demonstrate some non-traditional visualization styles to explore results. As a side note, the open ended answers to the text based questions were truly intriguing to read - hopefully the presentation of the results below will give you a small insight to what we learned. The first section of questions dealt with getting some context about our readers. Since the questions were multiple choice, we’re showing the results in traditional bar chart format. In terms of size, which of the following is your company most like? In terms of information presentation expertise, who do you see yourself as? If your company were stuck on Gilligan’s Island, would you be able to use information presentation to get rescued? No, Gilligan keeps using our Tufte books to prop up the break room table. Maybe. The Skipper rigged up this island beacon system using coconuts, vines, and tiki torches. You betcha! The Professor could build a huge island sized information display that could be seen, understood, and acted upon by the astronauts on the International Space Station. 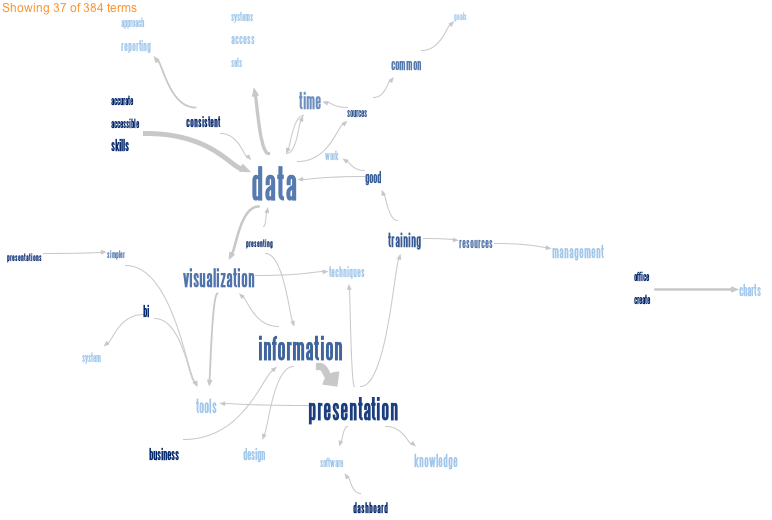 What two information sources do you most frequently use for information presentation tips, trends, and best practices? This is a great way to demonstrate how sites are "connected". 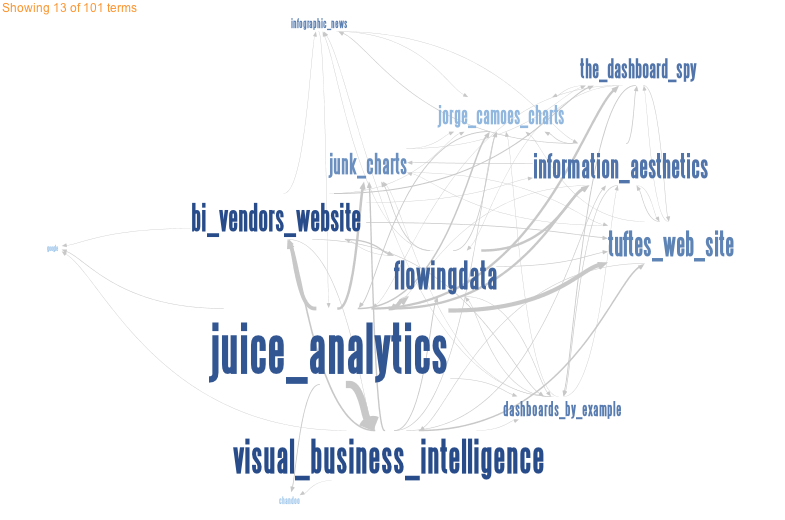 We see a very strong relationship between Juice and the other non-Juice sites, but not a strong relationship between the non-Juice sites, themselves. In retrospect, the question would have been more effective had we asked respondents for their "top three or four" sites (approximately: total number of options Ã· 3). The next group of questions were crafted to help us understand the problems our users and their organizations are encountering when it comes to presenting information to stakeholders and users. For most of these questions we broke the number one rule in surveys: stay away from text based answers. Using one word for each, list three things that you most frequently find useful from these sources? 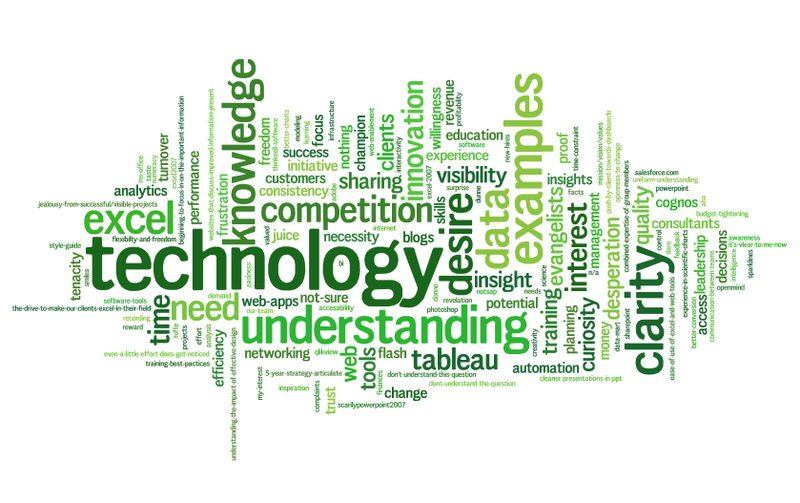 What one word describes the biggest barrier to improved information presentation at your company? I selected a Wordle (as opposed to a tag cloud) for questions 7 and 8 because I wanted to see the results in a way that would give me the general feeling of the barriers and benefits - I wanted the answers to spur some sort of emotive response. 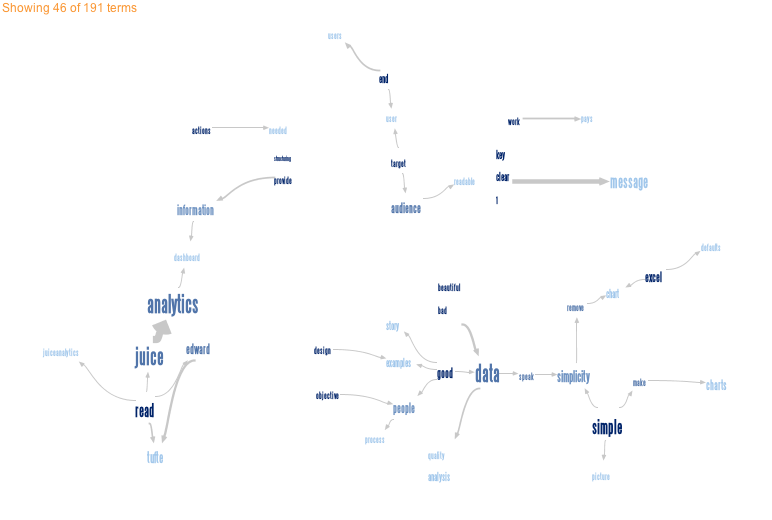 I think a Wordle does this better than a tag cloud. 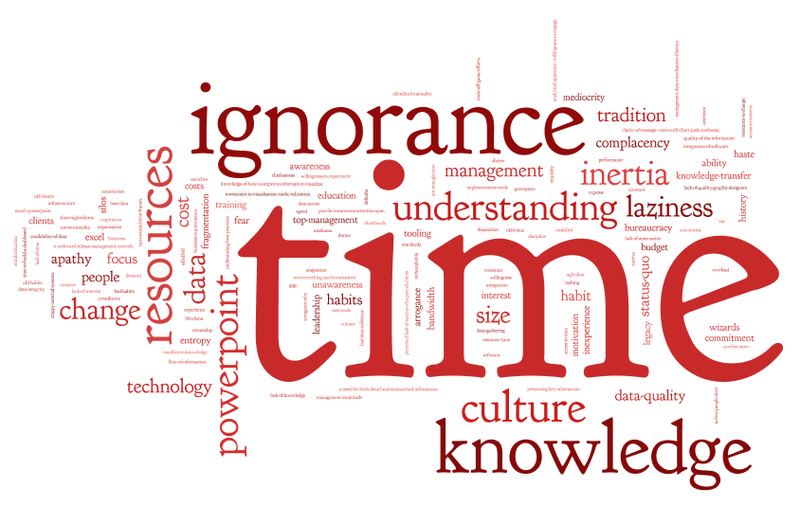 What one word describes the biggest boon to improved information presentation at your company? While the "barriers" answers were interesting, there are some real nuggets hidden in these "benefits" results. Finish this sentence: "My company would be oh so much better at information presentation if we just had..."
Finish this sentence: "If I were to advise someone on how to best improve your capability to create really useful information presentation solutions, I’d say don’t forget..."
What this shows is that organizations that are more capable of responding to tough information presentation challenges have a substantially higher ration of "Tufte Clones". A pretty nice linear correlation between company size and improvement trends, don’t you think? This post turned out to be much longer than I wanted it to be, but hopefully you found it interesting and learned a few things about your fellow readers and how to display different kinds of survey responses. If you have other insights you think you see, please comment below! Thanks for participating! The story of a mixed up metric. Monstrous $20k coffee brewing system for fanatics, err, I mean, purists. Incredible blog on system uptime, SLAs, rdiculousness of "Six 9’s", black swans, and how superbly FogCreek Software handles customer service issues. Chronicle of the lives of six popular Web browsers. We don’t tend to agree with Microsoft when it comes to data analysis and presentations. In fact, we’ve even been critical of them for misrepresenting data, excessive visual “flair”, missed opportunities to improve Excel, forgetting their power users, subpar presentation tools, and wasteful slide masters. “I’ve talked to a lot of customers about business intelligence and the one thing that they tell me is it’s really hard to use,” said Peter Klein, during at the Credit Suisse conference. “‘I’m not getting the value out of the investment that I made,’” Klein said customers had complained. “‘I have invested a lot in my back-end systems, and today 10 percent or less of my employees actually touch it, or get access to the data. I’ve got six different BI solutions across multiple different departments, none of which talk to each other. And they’re hard to use, so I’ve got to send people to training for two weeks to learn how to use it. Finally, we are speaking the same language. Now, I’m curious to see what they are going to do about it. Do you have Insurgent Data? There are two kinds of people in this world: those who put things into two categories and those who don’t. Maybe this isn’t the best representation of the complexities of the human race, but it does give me a cheap lead-in to compare two types of problem solutions: “high tech,” focused on tools, and “high touch,” focused on interpersonal communications. I was reminded of these two approaches by a recent interesting article in Wired that expresses an opinion about why America’s performance in Iraq has been disappointing. The basic premise of this article is that America has entered into this engagement in a “technology networked" fashion, drowning it in technology; the more, the better. The article suggests that the US forces would make more progress if they were to spend more time on a “socially networked" approach. For instance, instead of remote controlling a drone from 100 miles away, spend more time drinking chai with local leaders. Not the absence of technology, but the incorporation of technology into a socially based environment. Aren’t we witnessing this in spades right now in the BI space? There’s no lack of number of tools and number of features in these tools. The challenge is figuring out who the real insurgents are and how you deal with them. If you’ve been reading the Juice blog for very long, you have a pretty good feeling for how we approach what we believe is a social problem (high touch) and not a technical one (high tech). The good news is that the US forces are changing their approach to socialize more with the Iraqi people—hopefully leading to a better Iraq. Is there good news for the BI space? We’d like to hear from you on how you’re making sure you focus enough on the social “high touch" aspects of our space. What’s your insurgent data? How can you get to know it better? Last week, Google released Presentations to fill out their portfolio of online, collaborative document types (they already offer text documents and spreadsheets). The Google folks were kind enough to include us in a round of beta testing a few weeks back, giving us a chance to preview this application, find bugs, and offer feedback. If you give Google Presentations a try, you may be struck by its limitations. It doesn’t offer much flexibility in creating presentations, especially when compared to Microsoft PowerPoint or Apple Keynote. 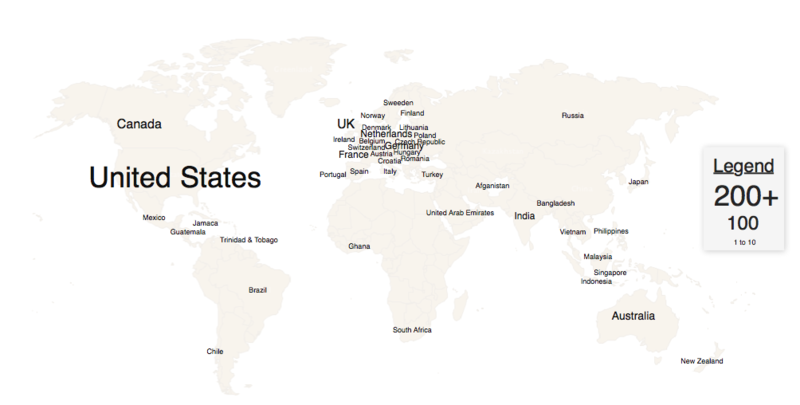 The best you can do is create simple text slides on a few predefined templates. On the other hand, it offers unique capabilities you don’t get with desktop applications. In particular, we were impressed with how easy it was to share a presentation live online. I have started to wonder whether calling Google Presentations a "web-based competitor to PowerPoint" or "a PowerPoint clone" was simplistic and misguided. Lumping together software tools is a natural reaction to long lists of features and techno-terminology. Software vendors don’t make it any easier to distinguish the differences when they attempt to convince us that their solution is the complete, do-everything tool to satisfy all your [presentation/data analysis/communication/networking] needs. So, we assume our software tools fall into neat buckets. We assume the tool we are using today do everything we need "well enough." And we assume any new tool is a direct competitor to what we use. As a result, we are severely limited in what we can achieve. For a long time, I was a fan and a heavy user of PowerPoint. It did what I needed. Perhaps I told myself that what it did was all I needed. A while ago, I had to break off this exclusive relationship. Now, I find myself using a bunch of different tools to communicate information. On the one hand, this has made my life more complicated. There are new applications to learn and the hassle of moving documents around. But in other ways, it’s easier. I use tools designed for the task at hand. And I have opened up a whole new realm of what is possible in terms of organization, polish, and audience engagement. The table below shows the activities involved in business presentations. 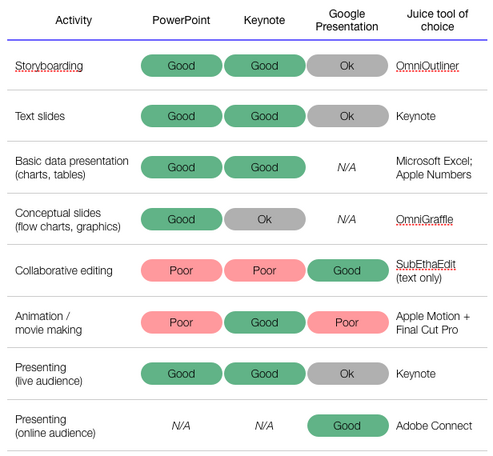 For each activity, I have a rough assessment of how well PowerPoint, Keynote, and Google Presentation perform. I also list the current Juice toolset. Pulling information from community contributed data. Top ten business videos on YouTube. Course readings and student notes. The presentation you dare not give. I laughed, I cried, I laughed again. A grab bag of ideas. A typographic symbol to indicate ambiguity, compare to the typographic mark lol which indicates stupidity. 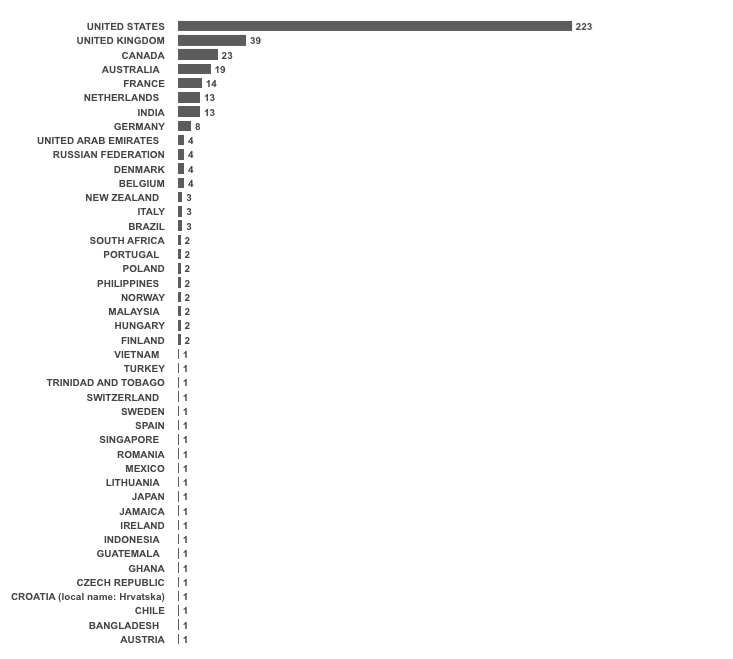 Good excel charting and visualization tips. A simple and fairly effective use of square pies. What is Worse Than a “Super Mugging”? I don’t know what you call it, but I know it when I see it. A couple months back I wrote about IBM’s sweet $80 million contract to develop ARIS (Achievement Reporting and Innovation System) for the New York City public schools. At the time I used some harsh words to describe this fleecing: swindle...preying on clients’ lack of expertise...Dr. Evil...wasted time and effort. The education department’s new $80 million student-tracking computer system just got more expensive - and some parents are questioning whether that’s the best use of the money. To ensure that children’s test scores and other private data don’t get into the wrong hands, the city began accepting bids this week from companies that specialize in safeguarding information, which experts say could add several million dollars to the system’s price. "What’s not lost on parents of kids in overcrowded schools is that with the money being spent on this, we could build and staff several more schools," said Tim Johnson, president of the Chancellor’s Parent Advisory Council. This initiative has mushroomed into a huge expense that threatens to overwhelm the entire school system, with all the SAFS, data inquiry teams, tests, and even the community district superintendents gobbled up to interpret and try to "coach" schools in the use of the massive data that will be spewed out. The DOE wants to charge much of this to the "contracts for excellence" and our CFE dividend, though it’s a real stretch to see if any of this falls under the specific programs outlined by the state. Good luck to Leonie, Patrick Sullivan and the others who are stepping up to question this white elephant project.